3) Hara: the introduction of The Compass (going beyond all images and ideas). I will explain the philosophy of the Peter Pan Project by relating it to, partly, of course, J.M. Barrie´s Peter Pan figure, but also James Cameron´s movie Avatar, the philosophy of Tolkien, and Antoine de Saint-Exupéry, who was another author with focus on the child within. The central debate in classical modern philosophy is between the epistemologies of rationalism (Descartes, Spinoza, Leibniz, Hegel) and empiricism (Bacon, Hobbes, Locke, Hume). The issue is the priority of either reason or sense experience. I would supply the expression of learning to See with the concept of the heart. The heart is the seat of consciousness, the Soul. Through the teachings of Learning to See with the Heart, the Life Artist perhaps becomes able to obtain a complete perception of life, without any division and separation. A perception which consists in, that you fully and totally exist; where you are what you are in progress with; where there are no inner spectator, theorist or doubter within you. Learning to See with the Heart is about seeing the whole thing, everything as a whole (seeing it through her eyes); that is to say: where you in self-forgetful openness are allowing the thing to fill you out. Seeing is a presence of something, which is not hidden. It is a presence of something evidently, something the individual has a clear understanding of. It is a presence of something straightforward, a presence in naturalness. It is a perception where you so to speak become drawn into the thing, and are melting into a unified Wholeness, which contains middle, fullness and light (this is what the 3D technology of the movie actually gives a taste of – therefore the importance in Seeing the Movie). Usually this happens in a short glimpse, inconspicuous; what you often describe as intuitive cognition. Suddenly you understand something. There is no causal explanation for it. Man is in habit of seeing the things from outside, fragmented. You observe the tree as something separate, you observe your wife or husband, as something separate, the office, the boss – everything in fragments; that is to say: from outside as something cut off. Meditation is about seeing the world, which you are a part of, completely, as a complete whole and not divided; that is to say: where you fully and totally exist, and the important is present and real; without letting the past and the future construct the Ego, the observer, who places himself outside the observed, which is life itself. In the same way, you can look at all the questions of life as a whole (as gestalts), and not as isolated parts. All this is the complete perception, where you not are outside, but in the middle of life itself. And then you truly are a Life Artist (or a Na´vi). Self-knowledge is the door you must open in order to reach into the source of the secret: your total being. And that is precisely not pleasant, therefore it is the fewest who are willing to do it, but thereby they also miss the most wonderful in life, which reveals itself when you have opened the door. What you must see, and experience, is what you in reality are. But to see, to observe and experience what you are, on the bases of a memory, means that the memory dictates, forms, or controls, your experience, and therefore it is already distorted. When a person is aware of a danger, there happens an instant action; the instinctive, immediate reaction of the body and the memory. From childhood Man has been used to meet a danger in this way, so that his being at once reacts in order to avoid physical destruction. The Life Artist must ask, whether it in the same way is possible to act immediate, spontaneous, when something is seen - without that it happens on the bases of your historical limited background. Can the human being react free, and at once, to any kind of distortion of the experience, and therefore act spontaneous? That will say an action where sensation, action and expression, is a wholeness (a gestalt), where they are total, and not divided in fragments? Philosophy as an Art of Life is therefore not the chase after a thought or an idea. It is all thinking´s essence, which is to go beyond all thought and feeling. It is, as Plotin said, the thinking´s journey back to its own ancient and pre-modern Source. Not until then philosophy is a movement into the unknown. Learning to See with the Heart is a voyage of discovery into the known, into your own perspective and history, into the whole of your world of ideas, knowledge, faith and experience, and through discrimination, to be released from it, and thereby to enter into the unknown, into the Source of wisdom (Eywa). On this journey you are in company with Odysseus, Dante, Faust, Neytiri and Jake Sully. James Cameron is currently working in New Zealand on three sequels to Avatar, which will further explore the Pandoran biosphere and, according to early reports, will introduce a new indigenous undersea culture dwelling in Pandora´s oceans. These new films will make use of pioneering methods of underwater motion-capture photography that represent a major leap forward in film technology. Another dreamlike extravaganza – endowed with the power to provoke a response that is at once visceral, emotional, and intellectual – surely awaits. If we only focus on the visual aspect, though, we´ll miss more than half the picture. We need to keep our mental muscles in shape (the Navigator) to think about the philosophical implications of Pandora. So, while we´re awaiting for the next installments of James Cameron´s epic cinematic wakeup call, let´s think over what already have been said. There will come more blog posts on the movie (see the blog archive Philosophy and Popular Culture). The three stages on life´s way is in my version a grounding movement from the head to the heart, helped by the Compass of Hara Awareness. This might seem odd, since many would consider it to be the opposite way around, but in my interpretation the movement is intimately connected to my concept of The Peter Project, where the central message is: Rediscover the child within! 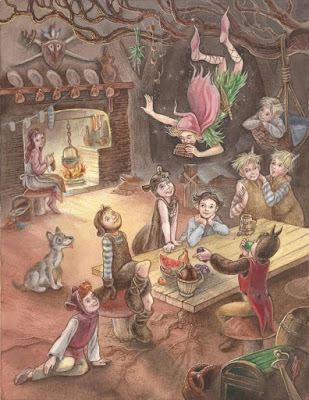 Childhood games of make-believe is an important element in The Peter Pan Project combined with the art of seeing life as a play without reason (see my blog post The Orchid Pavilion). So, maybe Peter Pan, like Antoine de Saint-Exupéry´s The Little Prince, is more like a children´s story for adults. Karen Blixen is certainly not for children. She is for adults. Tolkien represents a movement towards the child, and Saint-Exupéry is about rediscovering the child in us all; the last religious stage which in my view is the mystical experience. Both ethics and religiousness belong to the heart. In my view. Authors like Karen Blixen, Tolkien and Saint-Exupéry see the universals in man and life. Whenever we think of an abstract universal, we need to use a particular concrete image. But the converse is also true: whenever we recognize a concrete particular as intelligible and meaningful, we use an abstract universal to classify it, to categorize it, to define it: we see or imagine the Bedouin as a man, not an ape. Philosophy begins with, that human beings are wondering. We all know, how curious children are. Children want to know something and see much more, than the adults do, they catch sight of things, which the adults not even put notice to. Children’s nature is much more watchful, much more curious and eager to learn. They are lost in being. It is therefore children have so easy learning mathematics, geography or whatever subject. When we become older, our mind progressively becomes crystalized, it stiffens, becomes heavy and dull. We stagnate. We begin to have prejudices about everything and everybody. The mind is no longer open, to any problem we have taken position in advance. We are lost in becoming, or in the will to power. Said in another way: we are getting stuck in our heads, forced by the top-heavy Indo-European symbolism of growth seen a ladder. In his autobiographical work Wind, Sand and Stars, Saint-Exupéry talks about his wonder over the desert; over the wind, the sand and the stars. His books are filled with wonderful meditations over this, yes, that the nights could be so beautiful, that he, as a pilot over the desert, often felled into thoughts, and was in danger falling down. The prince wants a sheep to eat the undesirable plants, but is warned by the narrator that a sheep might also eat roses with thorns. Upon hearing this, the prince tells of his love for a mysterious rose that began growing on the asteroid's surface some time ago. The prince says he nourished the rose and listened to her when she told him to make a screen or glass globe to protect her from the cold wind. Although the prince fell in love with the rose, he also began to feel that she was taking advantage of him, and he resolved to leave the planet to explore the rest of the universe. Although the rose finally apologized for her vanity and the two reconciled, she encouraged him to go ahead with his journey. The Little Prince could be an analogy of our own forgotten (pre-modern) wonder over life: our inner lost philosopher and true Navigator. Asking philosophical questions begins with wonder, often generated by a severe existential crisis. When philosophy asks questions it directs itself towards the form, not the content. It directs itself towards the Inner Side of the world, not the Outer Side. The form, or the Inner Side, is the universal, that which we all have in common. The content is the particular, that which we don´t have in common. If you look philosophical at it, there is a difference between the individual person and Man himself. The individual person is a located being, who lives in a particular country, belongs to a particular culture, a particular religion, and who has a particular content of mind. Man on the other hand, is not a located being. Man is everywhere: the form of consciousness (the soul) is the same for all human beings. If the individual person only acts in a special corner of the extensive area of life, then he acts without any connection with the Wholeness: the form, or the Inner Side. You must therefore remember, that philosophy always talks about the Wholeness, the form, the Inner Side - not a part of it, not the content, the Outer Side. The smaller is in the larger, but the larger is not in the smaller. The individual person is the tiny image-limited, stagnated and despairing being, who is satisfied with his tiny gods and his tiny traditions, whereas the welfare and weal of all, the sum of the world´s necessity, misery and confusion, are lying Man on mind. The division of human beings, in for instance Westerners and Orientals, is only geographical determined and entirely random. It has no essential importance. Whether we live east or west for a certain border, whether we are brown, dark, white or yellow, then we all still are human beings who are suffering and hoping, fearing and believing: there is unhappiness and happiness here as well as there. There is not a special Western or Eastern way of thinking when it comes to Man, but the individual person creates these divisions on the basis of his background, which is limited by the images of time: the content, the Outer Side. In order to understand yourself you must go out on a voyage of discovery (a pilgrimage). A voyage of discovery, that goes into your ego and your personal history, and therefore into time as a whole. You must travel up The River of Heraclitus, you must travel up the river of time, which not only is your own personal history, but also the collective and universal history. You must become a Life Artist. In the longing after returning to the source of wisdom, from where all the philosophical questions stream, philosophy becomes an art of life, an exercise, namely meditation. In this movement in towards the Inner Side (the form, the universal, the Wholeness) you begin to ask philosophical questions in a meditative-existential way: Who am I? Where do the thoughts come from? What is consciousness and where does it come from? Is there a meaning of life? How does man preserve peace of mind and balance in all the relationships of life? How do we learn to appreciate the true goods and flout all transient and vain goals? Is the destiny of Man part of a larger plan? The ending of The Little Prince is also somehow sad. There’s no two ways about that. The prince has left the Earth—it looked like he died when the snake bit him, but his body is nowhere to be found. The narrator’s made it out of the desert, but that seems like nothing compared to wondering what happened to the prince. And the sheep. And the rose. The Little Prince says he is responsible for the rose´s safety. The narrator’s got questions that can’t ever be answered. Whether the sheep has eaten the rose or the rose is safe is a “great mystery”. This mystery, he says “alters everything”.